Large vertical format woodblock print of the sosaku-hanga (創作版画) type signed by Urushibara Mokuchu (漆原木虫) and made in the difficult years after the end of the Second World War, when the artist devoted himself to the production of his famous horses to ease his financial situation. 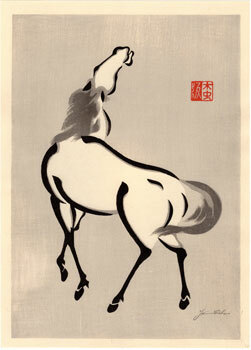 The horses of Urushibara Mokuchu (1888 - 1953) are stylistically related to the Chinese pictorial tradition. In fact, the artist, born in Tokyo but moved to London at the age of only nineteen, given his ability was even commissioned by the prestigious British Museum to restore and reproduce several important works including Chinese. 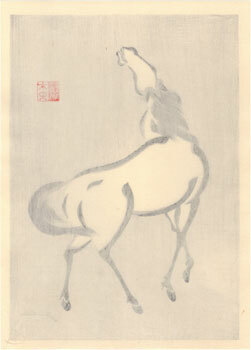 The print on Japanese washi paper (和紙) is in very good general condition.